If you like wearing Italian style suits, you'll need to wear Italian style shoes and loafers from Giovanni. Giovanni makes all of their leather shoes with Italian design. 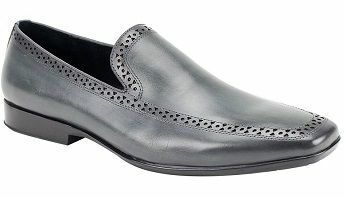 These sleek looking gray leather loafers feature classy Italian style with a perforated design that goes around the perimeter of the shoe.